Practical and efficient on road, cycle path and trail. 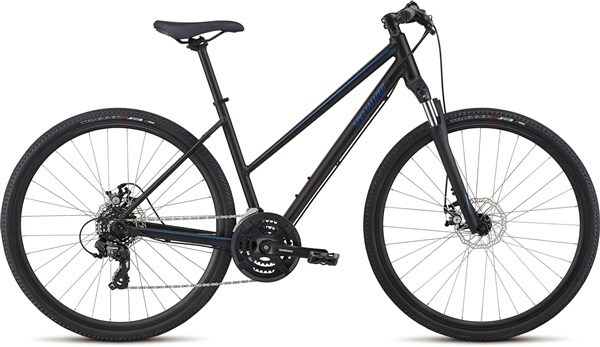 The Specialized Ariel is a women’s specific hybrid bike that features all-weather stopping consistency with wider tyres and a suspension fork to take the sting out of rough roads and tracks. The step-through frame design makes it super easy to mount and dismount the bike, great for traffic. Designed for women who want to mix adventure with fitness, the hard-working, sturdy A1 Premium Aluminium frame features our Women’s Fitness Geometry—meaning that you’ll go faster with maximum efficiency, only without the discomfort of an aggressive ride position, and a Step Through frame that makes putting a foot down easy. The more comfortable you are, the longer you’ll ride.